Create visually stunning and define your PPT Presentations in a unique and inspiring manner using our above template which contains a graphic of solution word with idea. This image clearly defines the concept of innovation. Our attractive image makes your presentations simpler and professional showing that you care about even the smallest details. Deliver amazing presentations to mesmerize your audience. Get your brains abuzz with our Solution Idea Business PowerPoint Templates And PowerPoint Themes 1012. Activate and analyse the ideas that emerge. 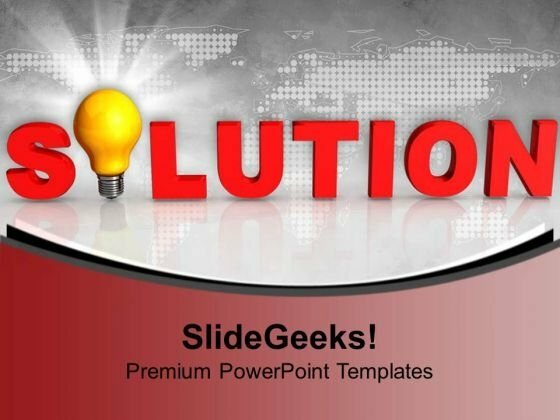 Hit exceptional ratings with our Solution Idea Business PowerPoint Templates And PowerPoint Themes 1012. Astound the audience with your display.